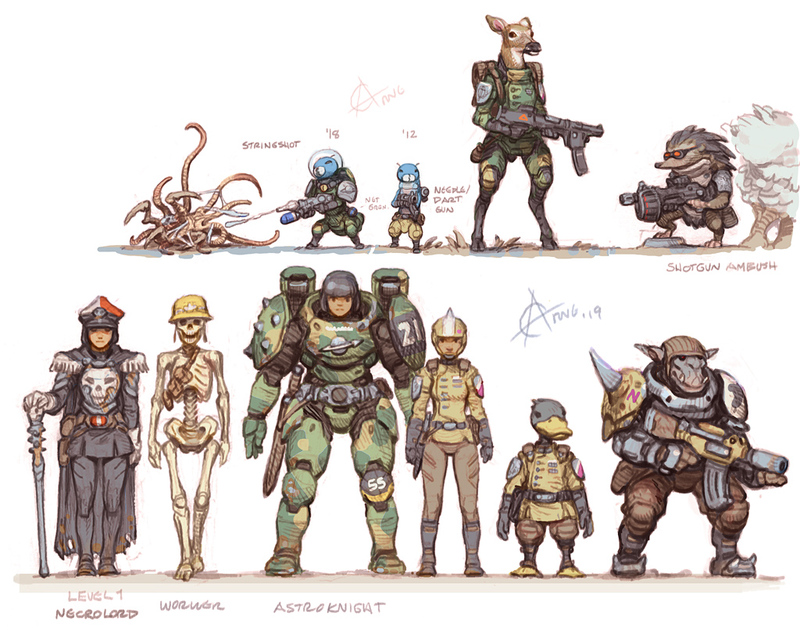 Within a nameless world in a nameless system somewhere in sector 001 lives the Gnomes, out of sight and out of mind of all other races. The peculiar tunnel dwelling creatures are about the size of a boot and not particularly intelligent. They are however long lived, born old in a sense, and share a collective memory. This psychic ability greatly accelerates their technological advancements and general understanding of the universe. Seven centuries ago, disaster struck. They lost almost everything in moments, their entire collective memory, and with that the ability to understand their own technology and history. Written accounts were unfortunately few and far between as books have little use to a race with such a powerful mental augmentation. Their advanced machinery also fell into a state of decay and much of it had become useless before they managed to regain some of their collective prowess. It was eventually understood that the disaster perfectly coincided with the death of the old gods, an event which tore both the physical and etherial realms asunder. 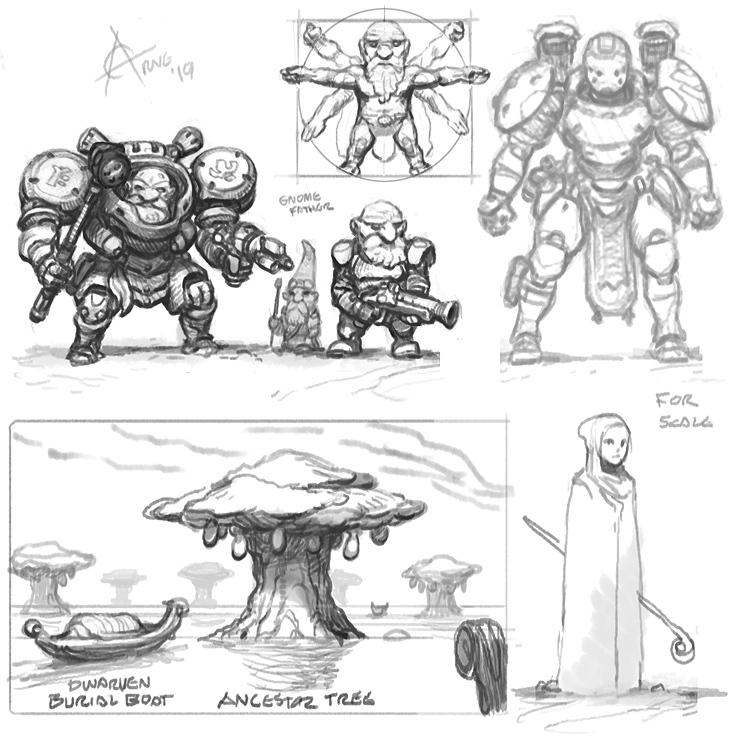 The exact origins of the Gnomes is unknown, but Gnome researchers believe, based on surviving artefacts and depictions, that they may have originated on another world in the sector. They're very different from other races, yet quite similar. Their sexless nature and unusual genome indicates that at one point they, or someone, may have created or altered them. The reproductive system of the Gnomes is perhaps the most unusual aspect of their physiology. Gnomes grow like fruits on "Ancestor Trees". When a Gnome dies, their body is buried in shallow water and a tree springs forth from a seed the chest. An Ancestor Tree can get very old, producing many Gnomes over centuries. In a sense, a Gnome is but a seed carrier for its Ancestor Tree. I wonder if Gnomes steal underpants... they wouldn't just go and do that... would they? After centuries of struggle the Gnomes on the nameless planet once again reached into space, and they saw terrible things from afar. Retreating back, they first relied on their psychic powers of suggestion to fend of minor system incursions, but it was soon decided that they needed something more as a safeguard. Fifty years of labour to create a massive super warrior began. They used their own genome as a base, but the resulting beings were twice as tall as a Gnome and many times the mass. Soon, these immense guardians, Sentinels, were sent out on scout ships destined for the far reaches of the sector to gather information and perhaps test their might against any monsters lurking in the void. Next, they would fortify any worlds they could find and gather resources. Not many of them returned. This was partially because the Gnomes had been rather paranoid about revealing the position of their home world to the sentinels. Only the scout ship computer had the position, and for one reason or another, these would apparently malfunction. Perhaps they had made the Sentinels too intelligent, too curious, making them prone to tampering with things and going off on their own. Their increased intelligence was meant to compensate for the lack of a collective memory, something which could have compromised the position of the home world. The psychic ability was not well understood anyways, and appeared to be somehow precariously linked with the Gnome base form. On top of this, the Sentinels proved to be unruly, stingy and cavil. The few Sentinels which did return revealed another problem with the plan... other intelligent beings would tower over even the mighty Sentinel. A new design was needed, something absolutely titanic. This time they would incorporate genetic samples brought back by one of the Sentinel ships who had chanced upon a mysterious derelict containing a great variety of frozen corpses. The "corpse ship" was never found again. Many decades of failures would pass as the gnomes experimented in their burrows. You are our guardians, our sentinels, our bulwark against the darkness. You are... hey! Hey! Oy! Where ya off ta? 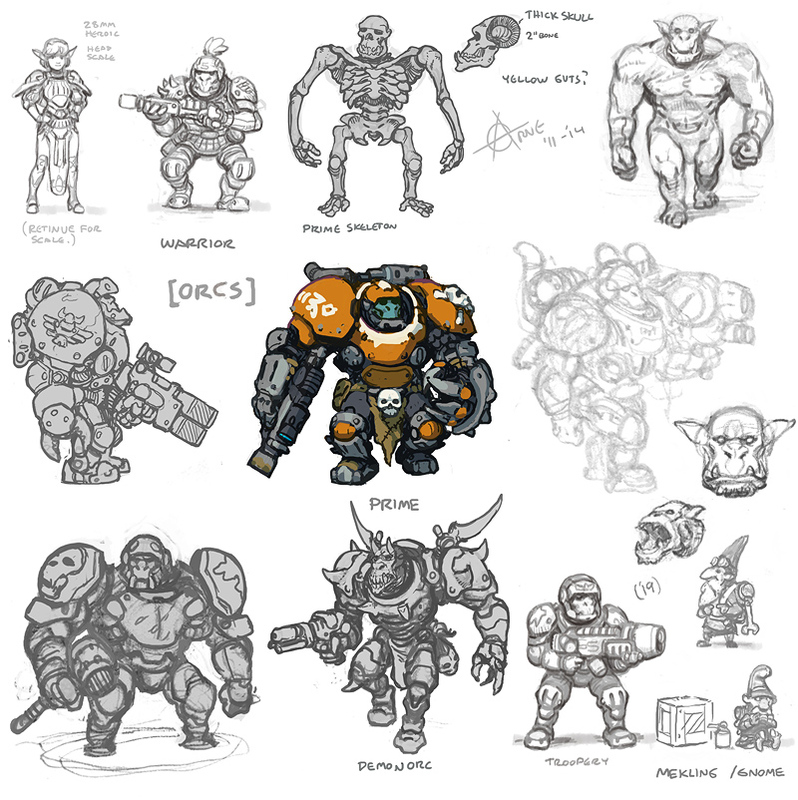 The new "Orc", meaning titan in Gnomish, was a sensible design overall. They were smart at an instinctive level, requiring little training, but lacked the runaway intelligence of a Sentinel. This would make them easier to control, it was believed. However, the large beings grew far too slowly, and their gestation pods were also too heavy for the trees to carry. Instead of compromising on size the Gnomes decided to change the Orc Ancestor Tree itself. Orcs would grow in hardened pods underground amidst the roots and hatch prematurely, but continue to grow after hatching, becoming larger with age. A strange concept. Very little of these trees show above ground. Instead nutrients are quickly drained from the soil. This would normally make a tree short lived, but as Orcs would discover, a battlefield is a decent source of fertiliser. 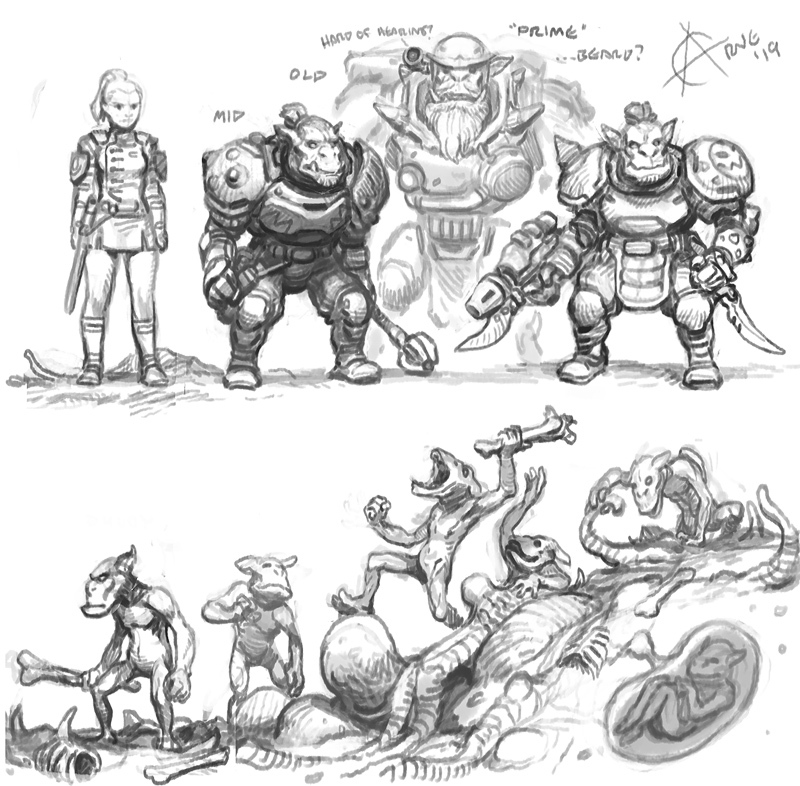 Orcs trapped on a planet can do an enormous amount of damage to the ecosystem, their warfare aside. Orcs are highly susceptible to the suggestive powers of Gnomes, but this means a Gnome has to somehow tag along with an Orc horde, which can be very dangerous for a being a little over a foot tall. Often, a Gnome will hide in a large icon or machine, delivering commands with thunder and roar. Another method is to directly control an Orc using a mind control helmet. When an Orc horde is under the command of a Gnome, it will gain tactical advantage and the ability to build awesome weapons, though not always so well put together. 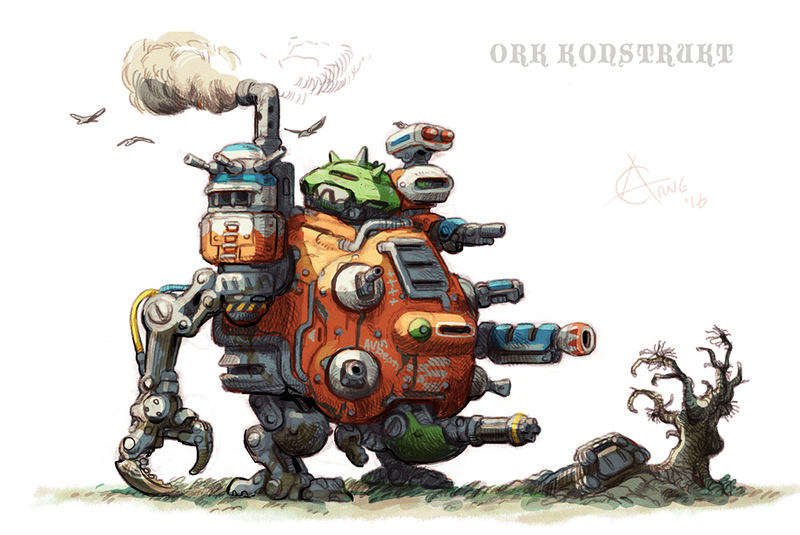 Orc hordes were initially deployed in a cunning way to lure, herd or force other races away from the Gnome home world. The Gnomes with their collective memory have a great advantage, almost a form of tactical omniscience. Of course, things would eventually get out of hand. Gnome controllers would die in the chaos of things, leaving large Orc hordes to their own devices. Often, these would quickly regress back to a more primitive state, eventually fizzling out. That was the plan. But things didn't go according to plan this time either. With the Sentinels the Gnomes had made the mistake of underestimating individual intelligence, something they had little experience with. The Gnomes, being born adults like their Sentinels, also had a poor understanding of growth, and this was their mistake with the Orcs. An Orc will grow from being be a bit taller than a Sentinel, to about twice as tall and more muscular. Usually they won't last longer than that due to... occupational hazards. The Gnomes' experiment only lasted a few decades and by the time they found out how large and cunning an Orc can really get, it was too late. So, currently there are three types of Orc hordes; the ones controlled by a Gnome trying to untangle The Big Mess, the wild strays in regress, and the ascendant now operating under a Prime. Earth's scientists understand very little about the origins of the Orcs, their factions, or their complicated genetic structure. Still, traces of both Elf and Gorilla genome have been identified in Orc specimens, which makes little sense from an Earthling's perspective. Gorillas went extinct during Earth's industrial age long ago, and there were no Elves on Earth then. Orcs are slightly hunched, so maybe a bit taller than a man when standing upright. Skintones... Orcs and Goblins have been green since the DnD age or earlier... seen some do them brown... Grey works poorly as the face gets lost in tech... maybe a blueish tint? 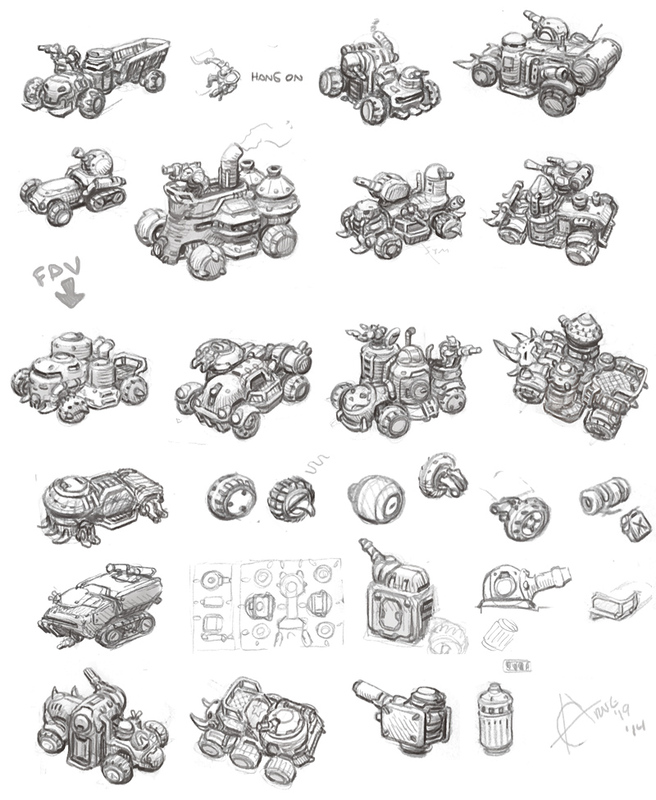 Here I've cleaned up some armoured car concepts from 2014. When doing these I was looking for asymmetric rounded forms, and something which feels like it could be repeated without looking like cloned unique instances... not too specific... but a more general representation of the Orchish haphazardness. My Orcs are perhaps a bit more organised than certain other Orks. More rounded shapes, adept construction, featuring some kind of standardised iconography. An eagle perhaps, to clarify that they are less crude. 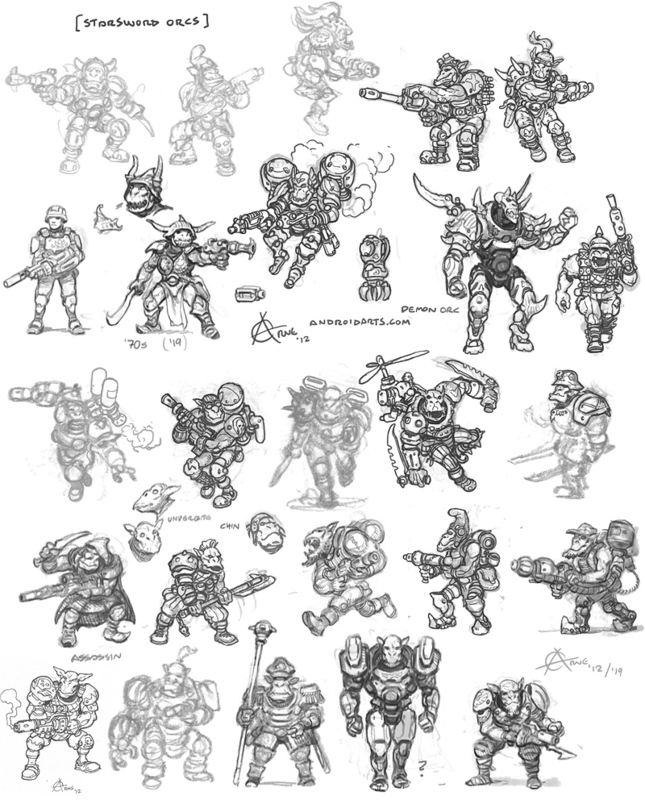 I'll have to scrap half of the design on this sheet... it's just exploration. The bottom ones are way too cartoony. I like the car top left. 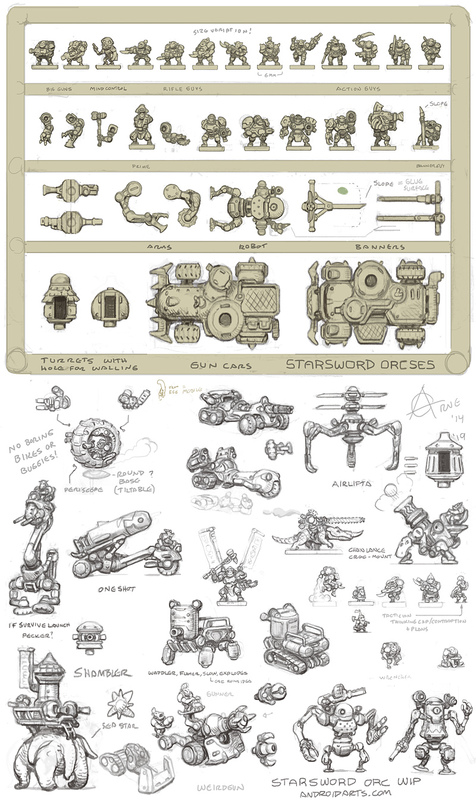 Orc unit designs from back when I was thinking of Starsword as a 6mm game. 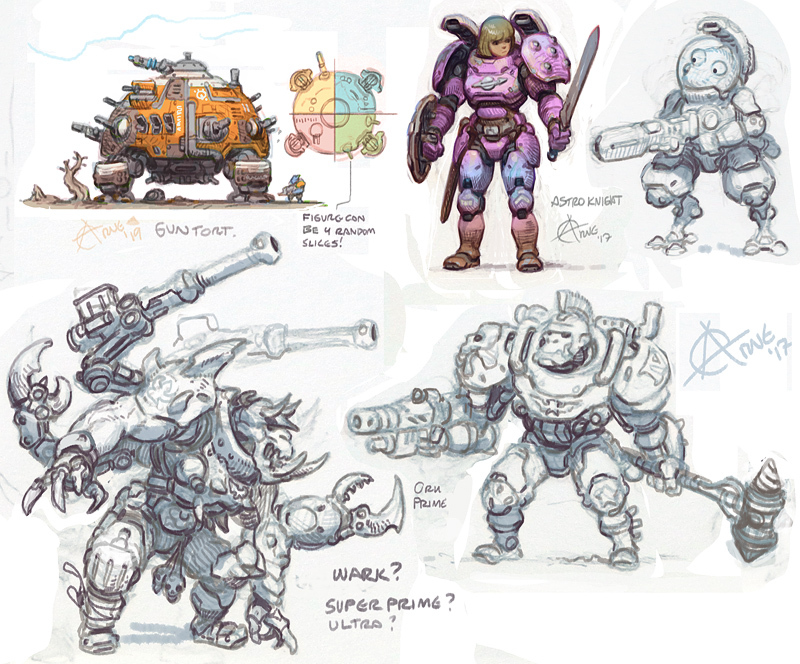 I wanted to keep the units kind of exotic to reflect the unorthodox/wild thinking of the Orcs (they mess up the designs of the Gnomes), and to differentiate from GW's tanks and trucks. A small fortress on top of a giant land-sea-star. Chain-lancer on crocodile mount. It's really quite unfortunate how we have to throw away so packaging. It's unavoidable for some types of products I guess, but toy packaging could be better as they are often stowed away. I had some thoughts here which carried over from my LEGO project. With a little extra cost, product boxes for miniatures could be reusable. There's likely economy of scale benefits to being able to use generic boxes like these too. IIRC, printed cardboard boxes are not cheap. When I collected 6mm Space Marine, I reused the little army boxes, putting walling or foam inserts inside, but it became hard to know what's in where with cardboard lids on and taping labels onto the nice cover art is a shame. 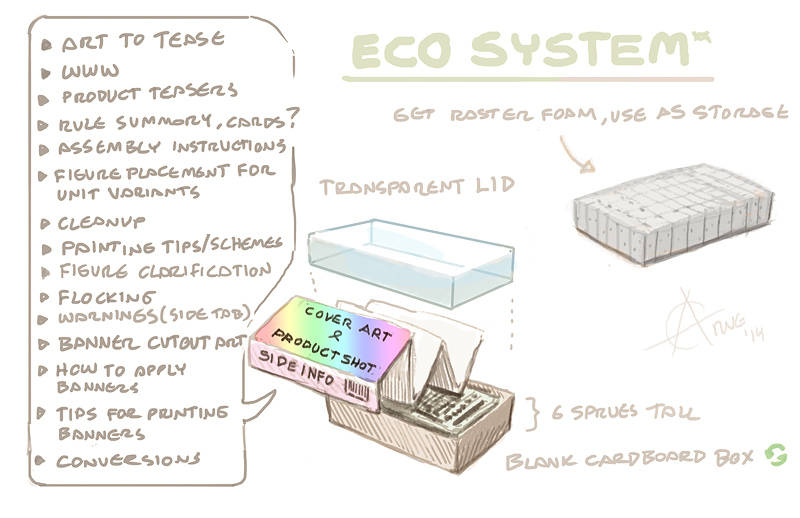 Ideas for the bases. I'd prefer either round or square, with a sloped edge. 90 degree edges look a bit sloppy/sharp. Bases are possibly a bit cheaper to tool if the detail is one-sided. One thing which kinda ruins tabletop wargames for me is how you never get a feel for what happened... the battlefield gets so barren. Simple corpse bases might be done using negative moulds & green stuff. I use oyamaru sometimes. Doing 28mm corpses is difficult because the battlefield is crowed, the figures are tall and need a bigger base when falling over, and you can tell if a corpse is a bad match due to the size. But 6mm can easily get away with generic vehicle & infantry corpses. A lot flatter too. 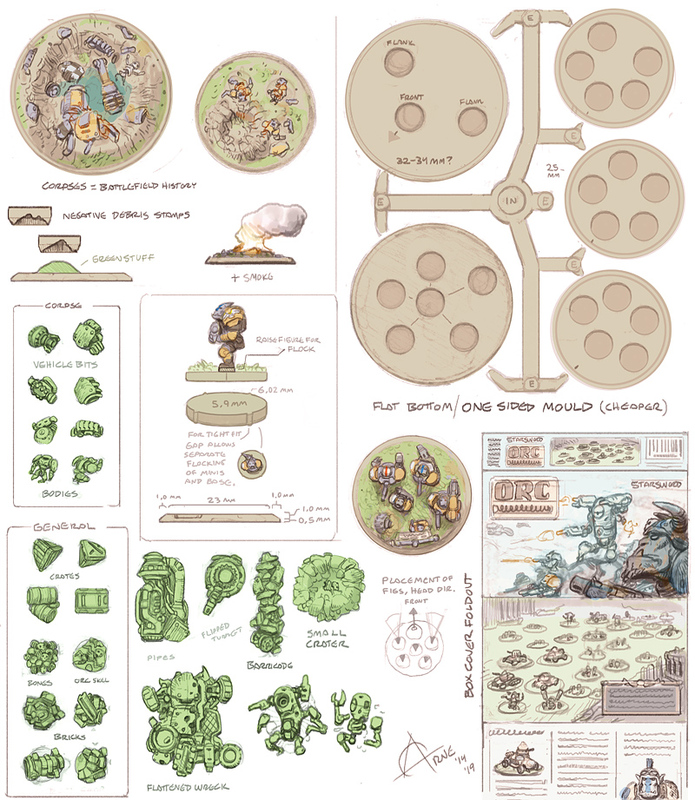 It might seem initially that rounded bases are less distracting, having no corners, but when units are packed together, their bases create sharper negative spaces than the square bases which can completely eliminate negative spaces, or at least make them look geometrically tidy. 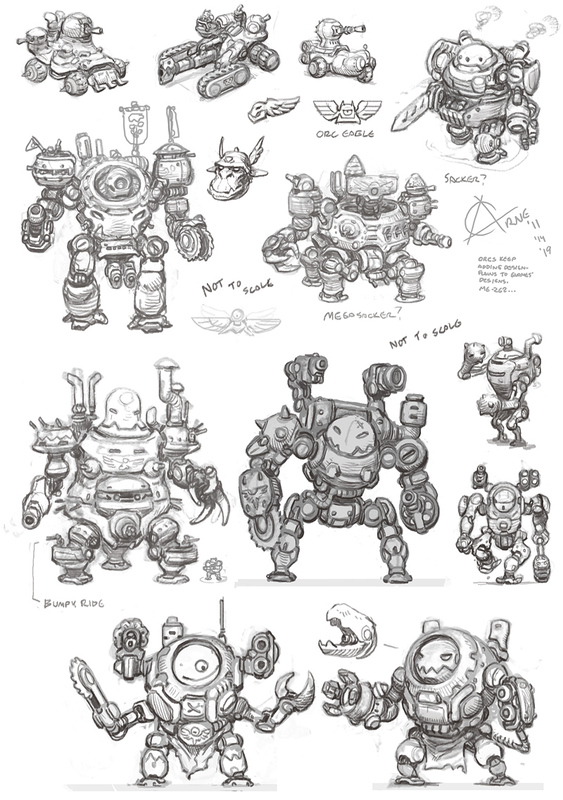 Ork Prime designs from 2011, and some stuff in the corner cleaned up (not actually to scale). As Orc age, they grow larger and wiser, and maybe even a beard. Had some vague ideas for demon Orcs at the time but I'm not sure what I was thinking. Noticed GW added "Prime Orks" in one of the recent books (2016?). 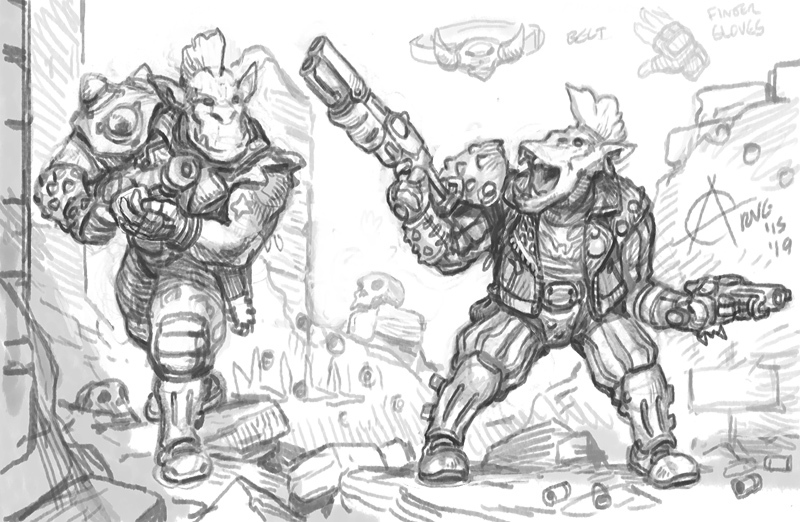 ... and '80s punk Orcs? Honestly though, I think maybe the future lies with the ducks. Orcs have been done and it's hard to avoid being derivative on a subject as exhausted as Orcs... and obviously being a fan of Paul Bonner's art there's really only one way to do proper Orcs! Orc Construct. Maybe too derivative still. Orc Construct try II. And some big Orcs. Warks? - Starsword project by Arne, 2008-2011-2019.